CRISTINA: "Hey! We stick together, we all did this. Nobody's a victim. We stick together. [pauses] Dammit!" RICHARD: "People! I know who did this, so you might as well come clean. I know!" GEORGE: "With all due respect, sir, if you knew you wouldn't be asking us." MEREDITH: "You have your suspicions, but you don't actually know." GEORGE: "And you can't do anything to any of us without proof, sir." ALEX: "We should be hearing from Dr. Burke any minute." DR. HAHN: "That's what you said half an hour ago. Well, whether or not we hear from him, when we hit that hour mark, I'm going in to get my heart." [opens door, sees Derek] "There's never a good place to hide in this hospital." Permalink: There's never a good place to hide in this hospital. "If you don't want to bend your precious rules for Camille, fine. Don't do it for her, do it for me. Do it for your wife who never asks you for anything, who says nothing about your long hours, who looks the other way while you have an affair with another woman, who sobered you up when that woman left you, who stayed with you when everyone said I'd be better off alone. I'm not asking you, I'm telling you. You're going to make this up to Camille. You're going to prioritize the needs of your family above the needs of your other patients or... or you're going to find a new place to sleep." MEREDITH: "Human beings need a lot of things to feel alive." DEREK: "But we only need one thing"
RICHARD: "To actually be alive." CRISTINA: "We need a beating heart." ADDISON: "When our heart is threatened"
ALEX: "We respond in one of two ways." GEORGE: "We either run or-"
RICHARD: "There's a scientific term for this." MEREDITH: "We can't control it." RICHARD: "One of you compromised a patient's life. One of you stole an organ. One of you jeopardized the integrity of this hospital and of UNOS. Now you tell me and you tell me right now. [silence] Alright, fine. No surgeries." RICHARD: "No one scrubs in, no one watches from the gallery, no one so much as goes near the O.R. Until someone confesses, you will share a single patient, Camille Travis. Whatever she wants, the five of you will provide it. Get the hell out of my sight." IZZIE: [to Richard] "I cut the LVAT wire." MEREDITH: "Actually, I cut the LVAT wire." 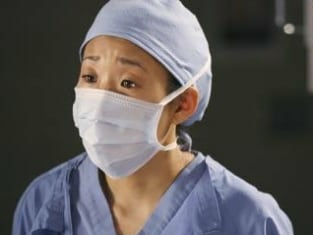 CRISTINA: "Fine, I cut the LVAT wire." ALEX: "I didn't do anything, I'm totally innocent." MEREDITH: "Thank you... for calling me about Izzie." GEORGE: "I didn't do you any favors." MEREDITH: "But it meant something. That you called. It meant something to me." GEORGE: "It didn't mean anything." GEORGE: "Stop saying you're sorry! [long pause] You wanna know something? I knew. I knew you didn't feel that way about me, even during... when we were in bed I knew. I knew and I still let it happen, because, um... well, I figured one night with you was better than never. So, will you just stop saying that you're sorry? 'Cause you didn't know any better, but I did. And I still let it happen. I'm sorry. [long pause] I'm sorry, Meredith." IZZIE: "He said marry me, right? He did? That really happened?" RICHARD: "Yang, Shepherd's asking for you." CRISTINA: [pauses] "For Burke's surgery?" CRISTINA: "Uh... I can't. I'm in a time-out. RICHARD: "Well, time-out's over, Yang. We need you." GEORGE: "Bailey's treating us like children. We're not children! We shouldn't have to sit out here like we're in time-out or something." MEREDITH: "What we did is way in need of a time-out." CRISTINA: "You realize we could get kicked out of the program for this?" IZZIE: "Not we. I did this. I did this. You're probably right, maybe I should run. But I'd rather be running towards someone than running away." CRISTINA: [after realizing patient is the one who shot Preston] "That guy shot you. Move." NURSE: "He's a lost cause." NURSE: "He's circling the drain." CRISTINA: "You shouldn't get to kill yourself, you do not get off that easily. [to nurse] Push hard dose epi!" CRISTINA: "What? I want to be able to tell his family I did everything I could to save his pathetic, miserable life. Give him three of epi. Now." IZZIE: "You press that code button and I will hurt you. Not a lot, because we're friends. But enough so that things will break and you lie on the floor out of my way." IZZIE: "You have a decision to make. You can stay here and help me with this, or you can leave. What's it gonna be, George?"